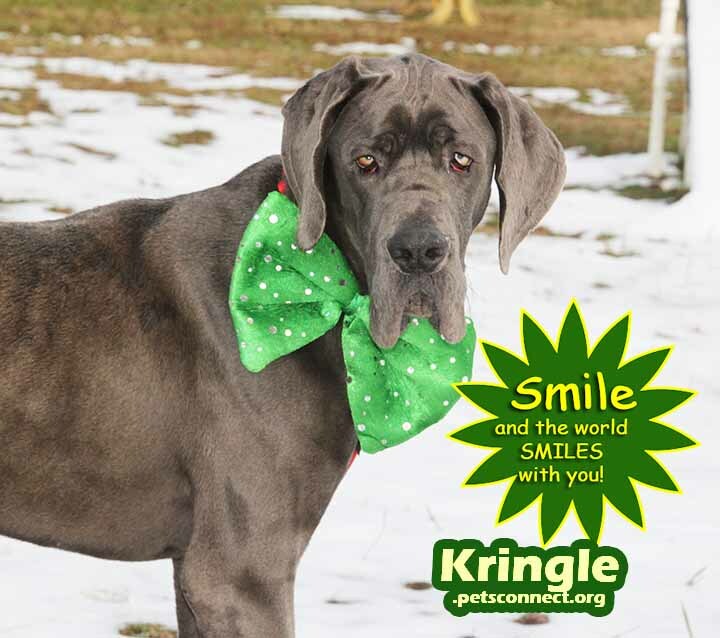 Kringle is a handsome as can be 8 month old Great Dane puppy. He is a big boy! He already weighs in at over 105 poounds. He is a pretty blue with some spotting. 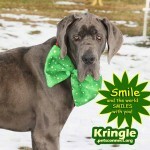 Kringle landed in a local animal shelter because he was just to much dog. 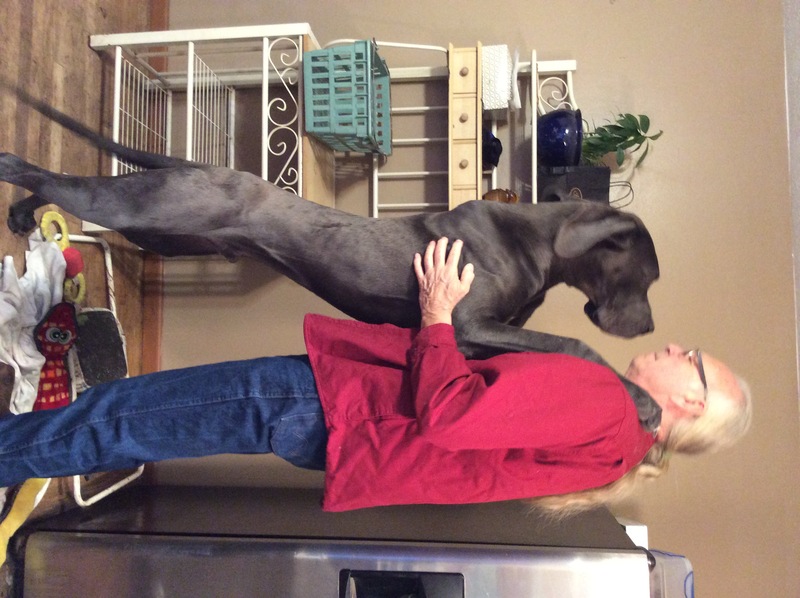 And let’s just say, when he jumps up his front paws easily rest on his foster dad who is 6’4. That is a lot of dog. At this time, our local animal shelters are beyond full. 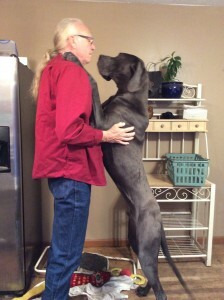 Fitting in a large pup like this is simply difficult. We gladly took him. In face the volunteers with PetsConnect have such generous hearts that four homes opened up. We all wanted him out of the shelter. The shelter kindly neutered him, for which we did pay for the service but still, that was wonderful and we picked him up the next day. We were told he was super awful, just all over the place, no manners, wicked tail. Well, yes, sort of but not really. His foster dad has worked with him on the weekend and after work on the week days and Kringle has sorted out to be a super nice pup. 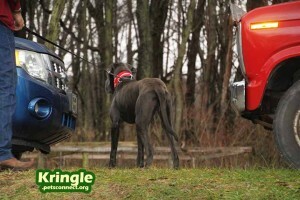 He is learning to walk with a no pull harness and doing well. We have a year old newfie and after some touch and go where the newfie just laid down because the dane pup was too much, they finally started interacitng and now will play chase in the yard. Soon it will be tug! I admit, our other two dogs, 40 pounders, have not been won over byt his new ‘monster dog’. 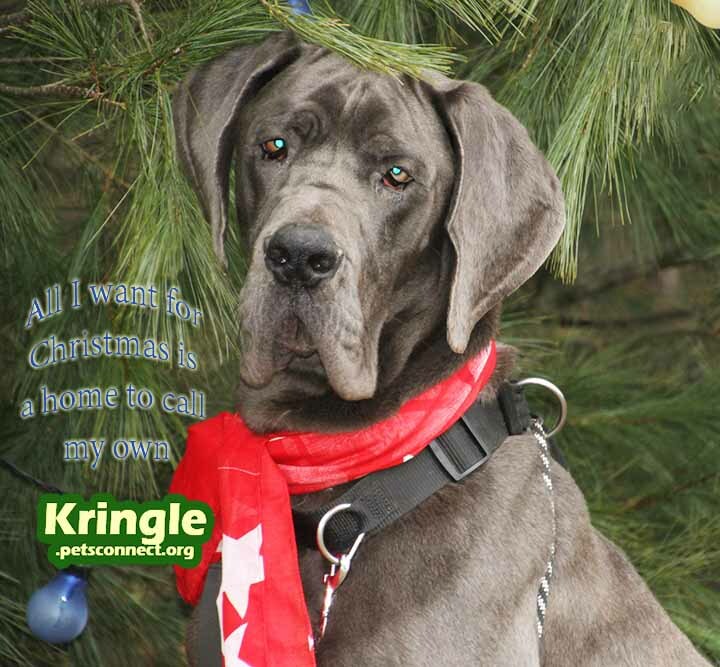 But Kringle is learning to give them their space. 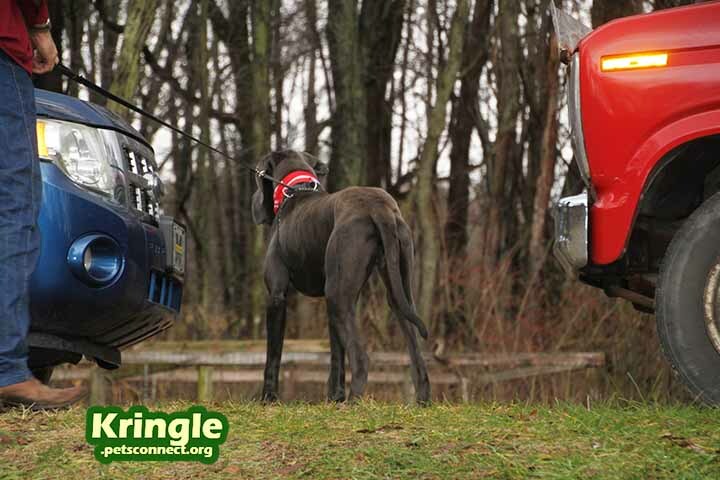 Kringle’s tail is not so bad. It’s on the thin side and he does not whop it around like some danes. He knows sit and we are working on ‘off’ and ‘down’. Now that he has calmed down, we can see his potential. 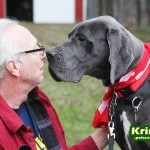 This is a super nice dog. Fenced in Yard – yes, a must. 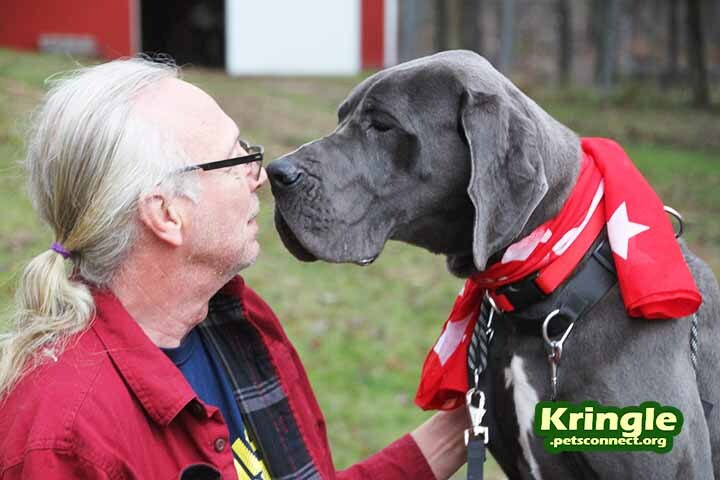 Great Dane Experience – oh, yes please. 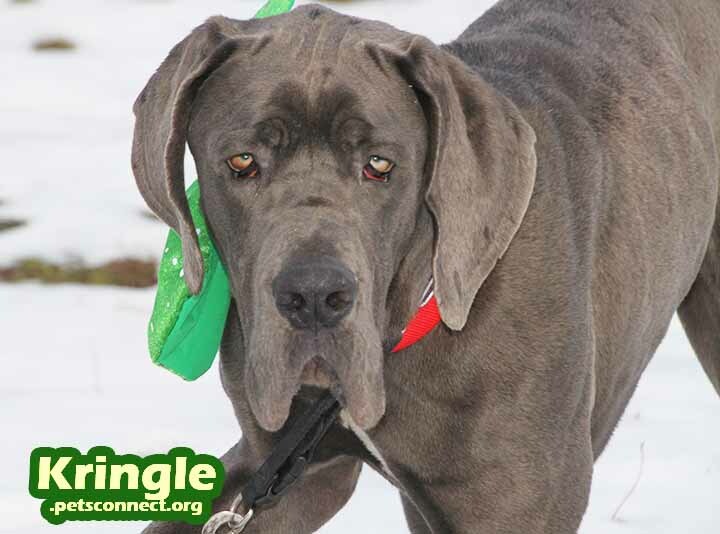 Dog Obedience classes – must be preapred and have the resources and desire to participate in a dog obedience class some place (we can offer suggestions for our area). NO SMALL DOGS, NO SMALL CHILDREN, Probably no cats as well. 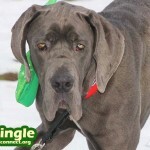 We are not sure how he would do with a cat but can’t imagine a cat, unless it’s Great Dane savvy, would see this boy as inviting! 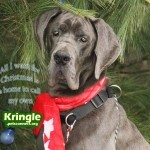 Kringle: Great Dane puppy from Sebrina Tingley on Vimeo.